Computer Exports - MFDC GROUP INC.
NEW, USED AND FACTORY REFURBISHED. We want longterm buyers from all over the world. COMPUTER EXPORTS CANADA located in Toronto, Canada is a wholesaler of surplus, new, refurbished and off lease returns used name brand Tier 1 computer desktop/tower, monitors and laptops in pallets or container loads. Brands like IBM, DELL, HP, etc. We export used computers to customers all over the world. 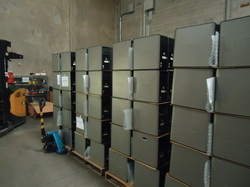 We also have hds, mouse/keyboard, cpu, ram, and scrap. In addition we also have NEW and factory refurbished computers/laptops and cpu/ram/motherboards,hds. We have many longterm satisfied clients in Egypt, Morocco, Mexico, Jordan, Ukraine, India, Uzbekistan, Pakistan, Moldavia, Georgia, Nigeria, Thailand, Cameroon, Indonesia, Russia, China, and many other countries.